The Tester role is a full partner in the Team, to help discover and eliminate errors and their causes. This is related to one of the most fundamental Lean principles: To aim for perfection and to improve constantly. To this end the Tester role uses techniques such as root-cause analysis, examination of processes and infrastructure, and gaining understanding of customer requirements. The Tester also helps set up a testing environment that is consistent with the Team’s quality and continuous test and integration objectives. 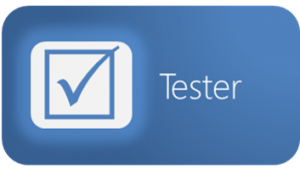 The Tester works with both Products Owners or similar business roles (such as Business Analysts) and Developers to help them create and conduct tests that provide adequate requirements and design coverage to detect errors and support their removal. Quality Assurance, also called QA or Q/A. Note that QA clasically includes more responsibilities than the Tester role and is not limited only to being implemented at the team level. Explore this role further in the Tester Reading Path.